Fontana Gardens ... the project sports an interesting facade. With the completion of Fontana Gardens in Juffair, Kooheji Contractors of Bahrain has further enhanced the level of sophistication in residential projects in the country. 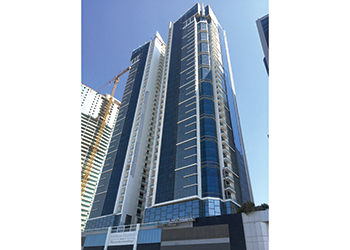 Comprising 400 apartments tastefully laid out in a choice of 17 configurations in three majestic towers, the project was structurally completed in April and is currently undergoing six months of testing and commissioning prior to its handover this month. Fontana Gardens – which has a built-up area of around 120,000 sq m – boasts 9,500 sq m of amenities and public areas that cater to different needs of the community including a large wellness centre with a spa, big multi-purpose hall with a clubhouse, nursery, arcade area, virtual studios for training martial arts, yoga, gymnastics, a large indoor vitality pool, Turkish hammam, a squash court, and 550 car-parking slots. In addition, there is 4,500 sq m of landscaping with one of the largest pools in Bahrain. That is not all: there is also a mini eight-hole golf course sitting on a 600-sq-m platform that connects two of the three towers on the fifth floor. Fontana Gardens was designed by an internationally renowned architect from Hong Kong, and Kooheji Contractors is both the developer and contractor of the project. Al Kooheji says there are nine different layouts and eight interior themes – which add up to a total of 17 different designs in terms of execution and materials and detailing. He says for a contractor, a residential project with so many different design configurations and numerous amenities poses huge challenges in executing it within a span of 30 months. Elaborating on the layouts, Al Kooheji says they cater to different market needs. There are studio and one-bedroom apartments, with two different layouts (executive and royal). For the two-bedroom apartments, there are three layouts (124, 135 and 175 sq m) while the three-bedroom units are available in two sizes (156 and 220 sq m). Another key feature of the project was the fit-outs. “We had a furniture package element within the project where our furniture factory coordinated all the designs and different materials – veneer, laminate, hard finishes of artificial stones, granite and marbles – and tailored them to create a signature design for each type of apartment. “The design was very detailed with different materials and makes use of glass and mirror cladding, and a lot of veneer laminate boards on the walls. Determination of different materials and the details therein was very challenging,” says Al Kooheji. Another interesting feature of Fontana Gardens is its façade where the designer and the client wanted to use silver reflective and clear blue glass to give a solid feel to one part of the design element and a more open feel to the other (see Page 65). “This was successfully executed after careful material selection to achieve a good U value of the glass, and at the same time a low level of reflection,” says Al Kooheji. Al Kooheji also points out that apart from challenges presented by the scale of the project, the contractor had to tackle the complexities of the variety of designs, materials, and procurement of materials from various sources. Hence, Kooheji Contractors had to approach several sub-contractors and vendors; he estimates that they had eight times the number of sub-contractors (more than 90) than in a standard project. This meant the level of coordination was high and very challenging – far more than it had anticipated when it took on the project. As the project unfolded, it presented numerous challenges due to the variety of designs and themes, which the contractor successfully tackled through effective communication using various channels, including apps, comments on drawings, etc, with the various stakeholders to ensure there was no shortcoming, he explains. To carry out the Fontana Gardens project, Kooheji Contractors roped in the resources of all of its in-house departments. “With a project of this scale, all internal departments needed to understand the scope. Starting from the tendering, budgeting, planning, quantity surveying, cost control, interior design, to the procurement department – everyone played a vital role,” says Al Kooheji. Al Kooheji says Fontana Gardens has three ISO certifications for quality, safety and environment. Fontana Gardens is the second in Kooheji Contractors’ Fontana series of projects with Fontana Towers having already been completed. Next on the horizon will be the Fontana Suites, which is under construction, and Fontana Infinity, work on which has just started. Fontana Suites ... under construction. Commenting on the concept behind the series, Al Kooheji says Fontana is a unique theme and the name comes from the Italian word for fountain. Using this concept, it decided to build around a living community with easy access all kinds of amenities – supermarket, laundry, restaurants, salons, pools, nursery, and security. 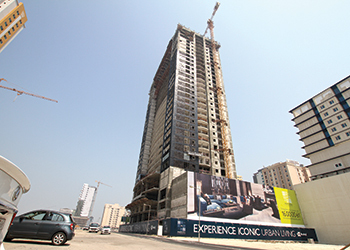 Turning to the 32-storey Fontana Suites which is also taking shape in Juffair, Al Kooheji says the project recently marked a milestone when a cantilever slab measuring 6 by 35 m was cast. Al Kooheji says a scaffolding system was built on a platform which was suspended between the 30th and the 32nd floor, where the slab was cast. 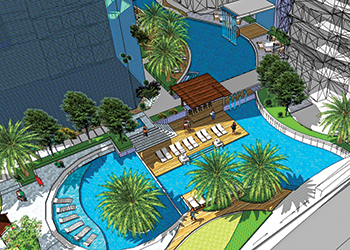 Fontana Suites, which has a total built-up area of 65,000 sq m, offers 373 apartments supported by numerous amenities. It offers tenants the largest and only landscaped waterfall in a residential building in Bahrain at 4 m tall and 16 m wide. The waterfall cascades from the 25-m Infinity Olympic pool edge into a plunge pool where residents and guests can swim and enjoy the tranquility of the flowing water. Kooheji Contractors’ other projects include the Spring Hill series – One, Two, Three and Four – some of which have been completed and others scheduled for completion by the end of this year. Two of these are in Juffair and one each in Seef and Amwaj. All of Kooheji Contractors’ properties are available on a freehold basis and are managed by Royal Ambassador. “We are a one-stop shop where we cover the needs of our clients holistically. We offer a seamless and well-integrated process,” says Al Kooheji. 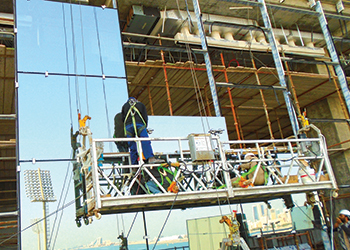 Kooheji Contractors started operations in 1973 as a small entrepreneurial family business with a vision of becoming one of the leading construction companies in Bahrain. Fontana Gardens ... boasts one of the largest pools in Bahrain. Commenting on the company’s capabilities and what makes it different, he says: “We are one of the very few contractors with a design-and-build capability. Kooheji Contractors is also one of the first in Bahrain to have established a CSR (corporate social responsibility) department through which it runs various projects that cater to the society’s needs. Kooheji Contractors’ activities are not confined just to Bahrain, but it also has projects in Saudi Arabia – where it made its debut this year – and Dubai, where it built a tower in 2008 and is now developing another residential project in the Cultural Village. Al Kooheji says his company is a regular participant at exhibitions in the region, and will be participating in the Bipex exhibition next month (November) and Gulf Construction Expo (previously known as gulfBID), in May 2017.